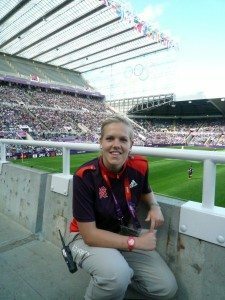 NUWFC player Hannah Marshall continues to live the dream as she prepares not just for the new season in the FAWPL but to be a part of the best Paralympics there has ever been. Following her recent role in Newcastle as ’Flag Bearer Team Leader’ at St James Park for all of the Olympic Football Fixtures Newcastle United Women’s Football Club’s player Hannah Marshall is heading for London at the end of this month to volunteer at what will be the best Paralympics there has ever been, with over 2.5 million ticket sales! In London she will be working in the Olympic Park as a ‘Field of Play’ Team Member at the Cerebral Palsy football, which will involve helping out with dressing rooms, training equipment etc. Two years ago Hannah applied to be a ‘Games Maker’ for London 2012 and has in her words ‘just totally lived my dream’! 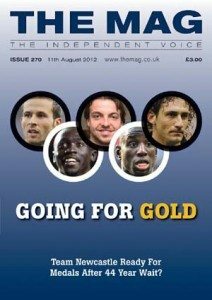 “Walking out of the tunnel and on to the pitch at NUFC’s ground, a team’s that I have supported all of my life, as part of a home Olympics; I really cannot put it into words! I have never felt such an overwhelming sense of achievement and pride to have been a part of something so special”. “The most magical part of it was sharing it with 48 local schoolchildren, ranging from the ages of 8 to 11 who were just hilarious and I was totally taken aback by their level of professionalism, enthusiasm and inquisitiveness. 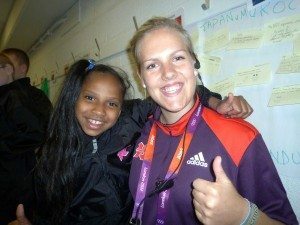 I honestly felt like I had been blessed with the best job in the world every day and I also felt a huge sense of responsibility in ensuring that these children had a positive and enjoyable experience at their ‘first Olympics’ and to use the Olympic Games as inspiration in teaching them the values of teamwork and friendship etc. The children didn’t really understand the scale of the event and how much of a once in a lifetime opportunity that they had been given and it was heart-warming how they took the whole thing in their stride asking me questions like ‘Hannah, can we do this again next year?’. The rest of the Games makers loved the children and we had a wall in our office devoted to the funny things they did and said, such as a boy eating some of the pitch so that he would remember it forever! “The children had the time of their life and so did I, I’ll never forget the first time the flags went on the pitch, I was reduced to tears! There wasn’t a moment that went by all week where I didn’t smile! What better way to inspire the next generation than the best Olympic Games there has ever been, at home!”. Everyone at Newcastle United Women’s Football Club wishes Hannah good luck and hopes she enjoys ‘Part Two’ of what will probably be the best experience you will ever have as much as she did ‘Part One’. * Hannah is still looking for a Kit Sponsor for the 2012-2013 season – Hannah gives so much to others please could you give £100.00 and be Hannah’s NUWFC Kit sponsor – visit www.nuwfc.com to find out more.